Egg Beats by Go Tunes – As Seen on TV. Available in four colors: blue, green, orange and pink. 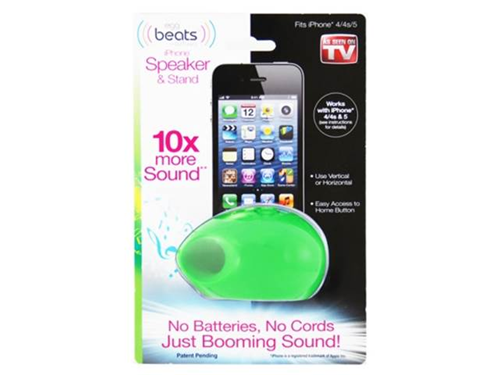 Self-powered silicone speakers - perfect for use with your iPhone 4/4s/5. Dramatically improve the volume and clarity of the sound. No batteries or cords required. Also allows you transform your iPhone into a speaker phone so that you can speak hands free. Case pack: 6pcs asst 2 colors each. Can supply breakdown of colors upon request.